Why do I pet battle? Why do I collect? Because it's fun for me. For. Me. What I collect, when, how, and so on is my own personal choice. This is my "me time" and I should be allowed to enjoy it as I please. It's a minigame that involves just me and my opponent (who's usually a NPC). That being said, spectate mode virtually forces this individual minigame into a form of public display. If you enjoy battling in private and in peace, out of others' view, you can kiss that goodbye come 5.3. Whether battling in the wild or with friends, your match will invite an audience. Unintentionally. Even if the attention is unwanted. As mentioned in a previous post where I previewed spectate mode on the 5.3 PTR, battling while hidden will no longer be possible if spectate mode is released as is. Stealth/shadowmeld battling will still be possible, but it will be useless as your entire pet team and NPC avatar will essentially shine a bright light over your pet battle encounter. Anyone that happens to travel by will see 6 little pets and either you or your stand-in, and know that a pet battle match is occurring. Now, if you're on a PVE server, the main concern will be that it's invasive having random people walk by and stop to stare at your performance. But if you're on a PVP server, not only will it be weird having an audience, it just invites all sorts of harassment from the opposite faction. You're rendered completely powerless with spectate mode, as your option to battle in peace will be removed. Many are probably excited for spectate mode, however not everyone will want to have an audience, even on a PVE server where the threat of PVP isn't big at all. Some may prefer to battle alone or might have anxiety when being watched. There are likely a few psychological factors that are being overlooked. The simple fact that player choice is being taken away will have some negative affects on a some players. In the beginning, I grudgingly accepted that PVP was inevitable and it wouldn't be removed from Pet Battles. It's understandable that developers didn't want to make a system that players could exploit in PVP or to get out of PVP. However, it was only acceptable to me because there was still a small option to battle while hidden. You may not be phased out like my idea of an ideal battle situation, but it gave me a slight chance to enjoy my minigame with fewer interruptions. I wasn't doing anything special, just using my class/race ability to my advantage. It's like a rogue who chooses to wander around the world stealthed while questing. They avoid being detected for the most part, but are still vulnerable to attacks at any time. So I was not completely removed from PVP and I was entirely vulnerable the entire time. In fact, there were more than a few times where the opposing faction found me and decided to knock me out of my match. Still, there was a nice balance of player option/control, while still maintaining intended gameplay. I could choose to hide, but there was still a large chance I would be found. To me, that was balanced. With the addition of spectate mode in 5.3, you won't even get a choice and that balance is all but removed. Everything will be out in the open. Battle while stealthed? Sure, but guess what? Your pet team and opposition will still be out there and in your place a randomly generated NPC. If that's not a signal to any and everyone passing by that someone is standing still, immersed in their battle, and ripe for the ganking, I don't know what is. Maybe a large "gank me" sign over their head? Don't get me wrong, though. I don't think spectate mode is a bad idea. It will be great for social events and just having fun when the player chooses to involve themselves in a multiplayer pet battle setting. That probably makes it sound as if I want my cake and I want to eat it too, right? How can I dislike spectate mode on one hand, but praise it on the other? Much like many new features and aspects of this game, some compromise wouldn't hurt. One way to give the player some control back is by allowing them to toggle spectate mode on and off. By default it could be on, and if a player doesn't desire an audience, they could turn it off. During guild contests or similar gatherings, spectate mode could be toggled back on. This would give players the option to play their own personal minigame in the fashion that they feel most comfortable with, while not removing the option to participate in a multiplayer setting. Another suggestion that my guildmate recommended was implementing spectate mode to occur only in a party or raid group. In this situation, only players in your party or raid would be able to view your pet match. This would give the player more control over viewership (if desired). If you wanted someone to watch your wild pet battle, simply invite them to a group. Or perhaps you only want your friend to see your match. You would have the power to decide who can watch and who can't. Don't want the attention at all? That's ok too, and you would have the option to make that happen. Both would be great compromises and would appease both gameplay and player option/control. Players that are excited for spectate mode and players who aren't will both have something to look forward to. Some really don't mind having others watch, and this new feature will be a great addition to the game for them. Those that do mind, though, shouldn't be punished for their desire to maintain a small sense of "me time", so an option for them should be included too. Perhaps I'm in the minority in this, and as the label implies, the minority is but a minor factor when it comes to the ultimate decision. There are many excited for spectate mode, and I'm excited for them. However, I do hope that developers will keep in mind that there are those that do play a little differently than most, and sometimes even the majority may want to hop onto the minority wagon too. Allowing the option to choose (while still maintaining intended gameplay) empowers the player and generates an all around 'feel good' response. And at the very least, if not for the coming patch since it's already well on its way, some consideration for a future patch would definitely be appreciated. Pets, pets, leveling pets, upgrading, more leveling, pets. PETS! - How to spawn the Unborn Val'kyr? - What is this year's Blizzcon pet/mount? - When will Blizzcon 2013 Virtual Tickets go on sale? - Will Murkimus Tyrannicus replace Murkimus the Gladiator as the reward for this year's Arena Pass? - When will 2013 Arena Pass registration start? - Solution for extra BoP Battle-Stones? - Upgrading to epic quality pets? The 5.3 PTR was recently updated and I decided to check out some of the new-ish features. I haven't been able to track down how to spawn the Unborn Val'kyr yet, but there were a couple other things that are worth noting. First off Murkimus Tyrannicus was added the the Pet Journal. It seems that it will be this year's Arena Pass reward. What it's a reward for, we don't know yet. But there's speculation that it will be for either simply participating (same as the requirements for the original Murkimus), or for being in the top 1000 arena teams. At the moment it's not clear, but if it's the former, it may replace the original Murkimus. If it's the latter, and players will be required to make it into the top 1000 teams there's a chance that there will be two pets to obtain from the Arena Pass this year. Needless to say if eligibility for Tyrannicus is dependent on getting top 1000, I will be very disappointed. I cannot express how much I dislike PVP. So to be put in a situation where not only do I have to participate, but must also win enough to place me at a certain rank? It's quite possibly the worst case for me. But anyway. Tyrannicus is not cageable and is basically a recoloring of the original Murkimus. His abilities are slightly different, though, and he has three attacks that the other does not have. It will be interesting to see how this Murkimus holds up against the original. Secondly, I tested out the new spectate mode for Pet Battles. It's... interesting. I could see it coming in handy in guild competitions and the like, but for those that don't want to be seen, spectate mode could be pretty invasive. - You can see both pet teams, alive and dead pets. - Every attack or move that a pet makes is also visible. - You cannot target the pets involved in the battle. - You cannot attacks the pets involved in the battle (AOE has no affect). - You can see any capture attempts (successful or not). So how will spectate mode affects stealth/shadowmeld battling in the wild? For those that don't want to be seen, this new feature will virtually force you out into the open without breaking your stealth/shadowmeld. If you engage in a pet battle while stealthed or shadowmelded, you will remain hidden. However, a NPC avatar (random race and class) will be spawned in your place (see female Pandaren in the first screenshot). This representation of you is not targetable or attackable. If someone gets close enough to you to detect your presence, the avatar will disappear. If they back up and you return to an invisible state, a new randomly generated NPC will spawn in your spot. Part of me wishes this feature were optional, and you could toggle it on and off. I like the idea of being able to determine definite winners in guild pet battle competitions, but I'd rather not be watched or visible while pet battling. As it is right now, if I'm not stealthed or shadowmelded, I'm already asking to be ganked as I'm just standing in the middle of nowhere doing nothing. At least if I shadowmeld, I remove part of that threat, although not all. It's still easy for someone to walk near and find me. With spectate mode being mandatory and not optional, it would place my entire pet team out in the open for all to see. That is just asking for someone of the opposite faction to come over and interrupt my match. Let's face it, some find it entertaining to be disruptive, and/or see it as a free kill. Spectate mode is like advertisement for everyone and all to come over and either watch or harass the participants. Being hidden won't do squat as everything else can still be seen. It's like marking the area in which your battling with a giant "PLEASE ATTACK ME" sign. It removes options and control over your own minigame, and it just seems to promote a frustrating situation that no pet battler wants to be caught in. Finally find a hard-to-find rare quality pet? Sorry, but because you've progressed through the match, killed the first pet and someone decided to kill you after that, your rare pet will not respawn. I'd much rather the option to turn this feature on and off, but since this doesn't affect most battlers (not everyone can stealth or shadowmeld or has toons that they can use to remain hidden) perhaps I'm in the minority with this mentality, though. Blizzard had a Q&A with developers this evening, and there were a few pet related topics. Here's a summary, but you can read the full transcript here. - The number of pet breeds for certain pets is varied, and there will be more breeds for some pets in the future. - There might be a possible pet scavenger hunt in the future. - Epic pets might be coming in patch 5.4. No details on how/where we'll obtain them. - Pierre is also planned for 5.4. - Developers are working on a solution for those extra BoP battle-stones sitting in your bags. Might be coming in 5.4. - Difficulty of battle doesn't always rely on quality of the pet you're fighting against. There are other things they can do to make a fight interesting. - Another round of Burning Crusade raid pets might be coming in the future, but an exact patch hasn't been decided yet. - If the new PVP features coming in 5.3 prove successful, they'll add more to the PVP side of pet battles. - Spectator mode coming in 5.3. In my previous post I mentioned that Blizzard was considering altering how a few pet family passives function, and the elemental family was specifically named as one on that list. Crithto has an update that includes additional pet families that are being considered. Again, everything is subject to further adjustments, but our ultimate goal is to bring all passives up to the power level of some of the current favorites, such as Undead." These are interesting changes, and since I'm not a pet theorycrafter, I can't really comment on how these updated passives will affect gameplay. It does seem that if all critter pets are immune to CC, they will probably come in handy in PVP. Currently, I don't really use ANY critter type (other than a snail) in PVE, as there are just too many pets and attacks that are strong against most in general. However, if CC's are useless against this type, perhaps I should start thinking of trying to work in more critters into my routine. But to be honest, CC isn't as punishing or as abundant in pet PVE as it probably is in PVP. So it might still not be worth it for me. For magic, I already thought these pets had a really nice passive, but with the changes to accuracy, perhaps this buff was needed. Most magic pets are pretty squishy (somewhat like glass cannons), so the buff will likely balance things out nicely. We'll see. The change to the aquatic passive, again, sounds like it will be most useful in PVP. As Crithto mentioned, many pets don't really utilize more than one dot (except for maybe oozes) in PVE, but in PVP there's a lot more room for a person to stack dots up. Much like critters, I don't think I actually use too many aquatic pets, and even with this buff to their passive I can't say that I'll make room for more aquatics on my teams. I'll likely give them a shot, especially if I know I'm going up against a pet that's dot heavy, but I don't think this change will really alter when/how I use an aquatic pet. There are more possible changes coming in 5.3, which include the Pandaren Spirit bags dropping stones, "bad luck protection", and buffs to a few family passives (specifically elementals). First up, two changes that will hopefully improve how often a player receives a Battle-Stone. The Pandaren Spirit Pet Supplies was long overdue for stones being added to their loot table, IMO. Even as a small droprate, it just doesn't make sense that you had a chance to loot a stone from all the other bags, but these were somehow left out. They're specifically named pet supplies, yes, but still pet supplies nonetheless. Another change that will possibly increase how many stones you receive a week is the "bad luck protection" mechanic. In any case, hopefully this will help alleviate the Battle-Stone dry-spell that seems to pop up every now and then. Sometimes I'll get two or three stones from one round of dailies, and then sometimes I don't see a stone for half a week. Same goes with battling wild pets. At times I can get two or three in one sitting, and then I'll get nothing but charms for two weeks or more. And that's me battling consistently. I can't imagine how frustrating it is for those that just don't have the amount of time to sit and grind on dailies and wild pets for stones. With the large amount of RNG already implemented into Pet Battles, a little consistency (if not predictability) would be nice. Let's hope that this "bad luck protection" works out for the best. The next update is about some pet family passives and how lackluster they are. Crithto just flat out says they plan on buffing some of these un-fun pet family passives. He names the elemental passive specifically, but there's a chance that some other passives will also be updated. "We're going to be buffing some pet passives in a future patch, and elementals are on the list. We feel that the elemental passive is currently too confusing in that it is somewhat ambiguous with regard to direct effects of weather, but not effects that are not directly related to weather. For example, if your opponent has a pet that gains an additional attack in a Blizzard, they will still get the additional attack against your elemental pet. This can feel bad in some cases and we want pet passives to always feel good and useful. We also feel that weather is one of the more fun and synergistic elements of Pet Battles, so at this point in time, we’re thinking of redesigning the elemental pet passive along the lines of a ~50% reduction in damage for the turn one is swapped in. Our goal being that we’d rather have a passive in place that increases the strategic depth of elemental pets, and is clear in its intention and functionality. Keep in mind, we’re still evaluating the numbers and everything is subject to change, but we’d sincerely appreciate any constructive feedback you may have!" We'll have to see how this one plays out. I do agree that the elemental passive was a bit meh, and hard to work with in terms of making use of it. There are only a few situations/weather types that it would actually benefit from, which makes it a pretty weak passive compared to other traits. Bad Robot? More Like Awesome Robot! MMO-Champion datamined an image for a red robot companion early in the 5.3 PTR, however it wasn't clear whether or not the model was really for a pet that would be obtainable by players. Lucky for us, Blizzard has announced that it will be a pet created by Engineers in a future patch! We still don't know when and which patch the robot will be found in, how players will obtain the recipe, what profession level will be required, and what mats will be necessary to craft the "Bad Robot". One detail that's been mentioned, though, is that everyone "has a chance to get their hands on this pet". This implies the pet will either be BoE or cagable and tradable. There are more changes to some pet abilities coming in 5.3, and you can check it out here at the official patch notes. I must say that I'm pretty disappointed about the change to Predatory Strike. It was one of my favorite abilities when first starting out in Pet Battles, and I still use it against the Beasts of Fable NPCs today. This change bums me out, but I guess it's just something we'll have to get used to. So there hasn't been as much for me to do these days except level and continue to grind for stones to upgrade my non-rares. It's starting to get a little tedious and my toons have well over 300 Lesser Charms to make up for the time spent grinding. I haven't gotten into pet PVP yet, and quite frankly, until 5.3 hits where a pet comes from winning X number of queued PVP matches, I'm not sure I want to bother. PVP is just not my thing whether it's player or pet. There's nothing in it for me as I don't get any kind of thrill or rush from beating another player. Wowhead has a great guide on the new Darkspear Rebellion (coming in 5.3), how to access it, and how to complete the quests/dailies/collect things in order to purchase the vanity items. Why should you care? It's how we'll obtain Gahz'rooki! As their guide details, you'll need to complete two scenarios before heading to Kalimdor to aid your faction in the rebellion. And yes, both factions will be able to participate and purchase the pet. Keep in mind that although these events will mainly occur in low-level areas, the quests and mobs associated with them will be level 90. This means that only maxed level capped players will be able to participate. Lower level players will likely need to purchase Gahz'rooki from the AH or trade with another player. Although the pet is BoP, it can be caged. To purchase the pet from the Darkspear Rebellion Quartermaster, you'll need to earn one Radical Mojo. The only way to earn this item is by completing a weekly quest called Battlefield: Barrens (available to both horde and alliance, with the same objectives). Before unlocking the weekly, though, you'll need to complete the quest chain first. During the initial chain, you'll complete the quest which will ultimately be the daily necessary to earn a Radical Mojo. You can preview the quest line on Wowhead's guide. It's going to be an interesting experience, especially for PVP servers, joining both factions in one area and "working together". We'll see just how much coordination and cooperation there is between players, heh. While I was on the PTR, I noticed a new neat feature. The in-game world map now shows the locations for all the Tamer dailies. Hovering over each one will show you the name of the Tamer and what rank of Tamer they are (Master, Grand Master, and so on). These markers are static, and only show up if you're a pet trainer. This means if you're still looking for a way to mark off the ones you've completed each day, you'll still want to use an addon like Pet Battle Daily Tamer. Speaking of the PTR... Mumper decided to nudge all of us pet collectors today. "Anyone on PTR caught an Unborn Val'kyr yet?" - It is not exclusive to Icecrown, but it is in Northrend.. somewhere. - Phasing shouldn't be an issue when searching for this wild pet. - The description in the Pet Journal is not relevant to how it spawns, but it does have a new spawning mechanic. I've been wracking my brain trying to think of ways a pet would spawn under certain conditions. Kill myself? Die to an elite? PVP? Dance naked in front of the LK? So far nothing has shown even a hint of being on the right track. Hopefully those on the official Pet Battle forum have more success than I! Update: I'm relieved to say that I'm not a pet hunting failure, and my efforts were only hindered by the fact that the Unborn Val'kyr wasn't up on the PTR yet. XD I thought I was starting to lose it! A new pet and achievement was datamined in the latest 5.3 PTR build. And a new type of battle-stone? The newest pet is called the Blossoming Ancient, and according to the Pet Journal on the PTR it's from the Blizzard Pet Store is not cageable. This can/may change in the future. From the image on MMO-Champion, it looks very much like a mini Ancient that roams around the druid-y, forest areas of Azeroth. But this not your ordinary Ancient. No, according to MMO-Champion and Wowhead, this pet actually changes colors depending on the Season! 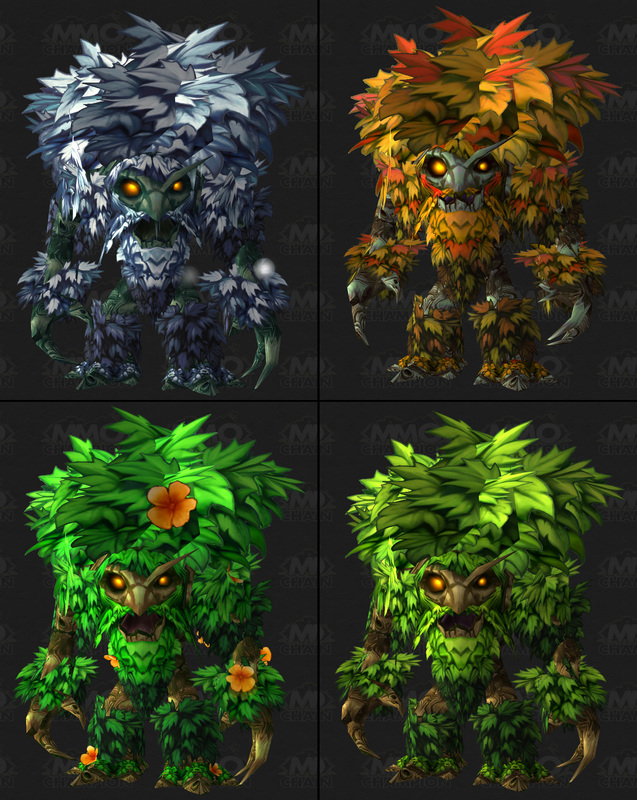 That being said, four color variations have been datamined to showcase its shift in foliage. That's going to be such an awesome pet, and I've been waiting for a new pet with a neat animation for a while! Glad to see they implemented one that sounds so awesome. Another new achievement was also datamined, and this may bring an extra perk to traveling around and doing Pet Battle dailies. The achievement, appropriately named The Longest Day, requires you to complete all the Pet Battle dailies listed. Currently, there are only three in the criteria, and they're low level, but this could change over the course of the PTR. The reward for completing this achievement is a Marked Flawless Battle-Stone. This is new, BoA, but can be applied to any pet family type. It should not be confused with the already existing BoE, generic Flawless Battle-Stone. My question is if this achievement will be tiered, progressively listing more dailies as the tiers get higher and higher, and rewarding a Marked Flawless Battle-Stone for each tier completed. I think it would be neat to reward those that go out of their way to complete many dailies per day, but having just one achievement and one rewarded Marked Flawless Battle-Stone doesn't seem to fit well. There are so many Pet Battle dailies, and I'm sure there are many who actually do the majority of them on a daily basis. To credit only a few of the quests and not the rest seems stingy. Plus what will the impact be of having only one Marked Flawless Battle-Stone? Since it's new and so unique compared to the existing stones, will players feel like they need to hang onto it and "save" it? If there were more available (through the achievement), will players feel less likely to hoard the Marked Battle-Stone? Well, we'll see. The PTR is still up and running, so changes can occur at any time. I'm pretty excited for this new pet and achievement, though! There are a couple updates on 5.3 changes and additions. First off, Mumper announced on Twitter that the Viscous Horror pet coming in 5.3 would no longer be a heroic-mode only drop. Instead, it will have a chance to drop on both normal and heroic versions of Primordius, Throne of Thunder. The other blob pet that comes from Primordius, Living Fluid, will only come from Primordius in LFR. While I know some didn't mind the heroic-exclusive pet, I think many will appreciate the slight increase in chance that they too will receive the Viscous Horror at some point. This opens up the availability to many more players, which is great considering how many people are into Pet Battles now. Exclusive pets have their place, but I just don't think that place should originate from raiding. Second update comes from the official Battle.net blog, where Crithto discusses the changes made to hit and accuracy in Pet Battles, as well as some updates on the consequences of altering these mechanics. - Higher level pets have had the base 5% chance to dodge removed, and the chance to miss a higher level pet has been reduced from 5% to 2%. This essentially means you'll be more likely to hit when facing a high level pet (that's close to your pet's level range, I'm guessing). - Finally, they haven't messed around with crit just yet. It's hard to say how these changes will affect some pets and their attacks, and we'll just have to test them out and try different combinations come 5.3. In other Blizzard sales news, Blizzcon 2013 tickets will be going on sale April 24 and 27! The price per ticket seems to be the same as the 2011 Blizzcon, which was $175 USD. I'd love to go, but I'm still debating if I will. Money doesn't come so easily and time is tight these days. Even if time were money, I would still be short! :P On top of that, it's not guaranteed I'll even be able to purchase tickets. The 5.3 PTR has been updated with new and interesting notes! At the time of this writing, only the EU patch notes were updated, but I'm sure the US ones will be changed to include the following as well. I'm most interested in sections that are italicized! - Pet Battle Duels are now available in all dungeons and raids. Enjoy! - Pet Battles in the wild and duels are now viewable by other players in the world. - Hit Chance is now displayed for all abilities. - Abilities no longer have a base chance to miss or be dodged by opposing pets of the same level. - Reduced the chance to miss when fighting higher-level opponents from 5% per level to 2% per level. - Blistering Cold had now deals 100% more damage. - Wins for max-level, matchmaking PvP pet battles can now be tracked in statistics. - Battle pets' recent ability loadouts will now be saved when pets are swapped in and out of battle slots. - Species specific Flawless Battle-Stones are now Bind to Battle.net account. - A number of new battle pets have been added to the Throne of Thunder and Isle of Thunder. Happy hunting! - Whispers from pet tamers in the north have spread word of an elusive new battle pet that can be found in the frozen tundras of Northrend. The Unborn Val'kyr awaits. - Battle Pet drops have been added to Burning Crusade raids. These new pets can be obtained from raid bosses in Karazhan, Tempest Keep and Serpenshrine Cavern. Obtaining all of these new pets will reward players with a new battle pet, Tito! - Ethereal Soul-Trader has been returned to his original, larger size. - Beasts of Fable daily quest has been broken into three separate chapters. Players can now choose to do any or all of the chapters each day. Rewards have been modified to include a new consumable that will boost battle pet XP for a limited time. - All Beasts of Fable and Spirit Tamer quests will now reward experience and lesser charms. - Increased the difficulty of elite pets on the Beasts of Fable quest. - A new weekly quest for max-level, matchmaking PvP pet battles has been added. For all those out there who were looking for a way to include Pet Battles as a guild competition or fun-day event, you will be able to in 5.3! I'm going to want to test this out on the PTR, as I'd like to know if it will be seen in real-time and if all the animations for attacks are the same. Or will it be a less graphical battle for those spectating, and will it lag behind the actual round? Mumper mentioned on Twitter not too long ago that abilities would be saved when swapping pet in and out of your team in patch 5.3. :D This has been a long awaited feature of Pet Battles, IMO! No longer will we have to worry as much about having the wrong moves prior to entering a battle. Yaaay! As discussed previously, the Beasts of Fable daily really is being split up into three optional parts in 5.3. And even better? You can choose to do one, or two, or all of them in a single day. And even better than that?! All three reward a daily bag, which means two extra BoF bags per day (should you decide to do them). I wonder just how "difficult" the BoF NPCs will be, though? To the point where many will still it's not worth the time/effort? We'll have to test it out on the PTR to see just how much of an increase in difficulty each battle is. I know some people already struggled with a select few now on live servers. I'm not usually a fan of April 1st. Most of the jokes and tricks aren't all that amusing to me, and some just seem cruel. But I gotta say, I always love WarcraftPet's take on the day! This year might be my absolute favorite out of the many years of silliness. XD Waka waka! I almost want an 8-bit pet just for the laughs.